The ripe avocado on my counter was just begging to become part of a luscious cocoa frosting, topping these wonderful raw brownies. I decided to try adding figs since I had some I needed to use. I love the little crunchy seeds, but if you prefer, you can substitute dates for a smoother flavor. These taste truly decadent, but there’s nothing decadent to ruin your diet! Plus, with only 8 simple ingredients, they didn’t take long to prepare. They’ll stay fresh for at least a week in the fridge. (If you can make them last that long.) Enjoy these guilt free goodies! Blend all brownie ingredients in food processor with low s-shaped blade. I started with 4 figs and 8 dates and added another fig and a couple more dates. You may try the lesser amount and if brownies are too dry, add a few more dates and/or figs for consistency. Press and shape batter evenly in 9”x 9” pan. Set aside for frosting. In food processor with s-shaped blade, blend all frosting ingredients until smooth. Spread on top of brownies. I cut into 1″ squares since they taste quite rich. This entry was posted in desserts, Recipes and tagged avocado frosting, brownie, chocolate, gluten-free, healthy, raw, vegan, vegan cooking, vegan recipes. Bookmark the permalink. 13 Responses to A Healthy Chocolate Brownie Fix? Oh Yeah!!! 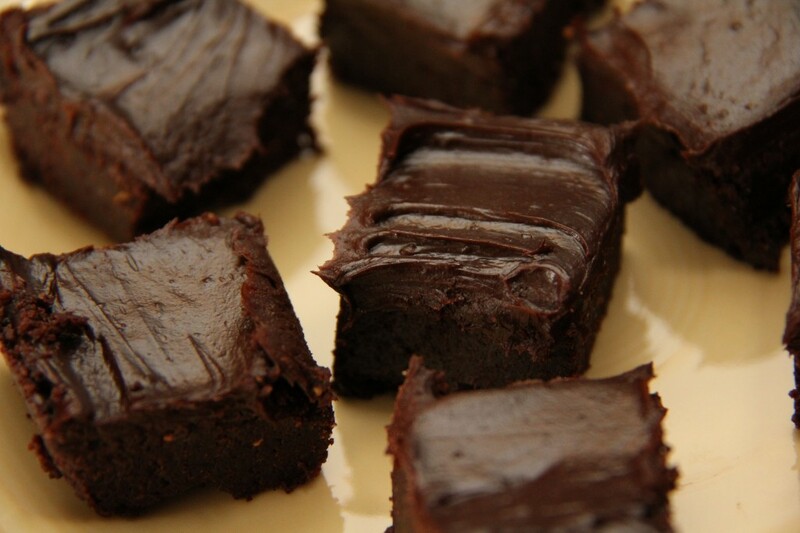 These brownies look utterly yummy!! Thanks Paula! I think they are delightful – enjoy! Wow these look so decadent. I have all the ingredients too. Guess what I’m making tonight?! Thanks for another great recipe. I have heard of medjool dates but haven’t seen them at stores. Do you get them from maybe whole foods? I heard they are the best dates. I get mine at Costco. I’ve also seen them at Middle Eastern grocery stores and you may be able to find them at a larger local grocery. They are really good! Thanks, glad to know I can find them at Costco. Avocado frosting? Have you been watching chopped? These, like everything you make, sound uber-delish!! I’ll be over this weekend!! Oh…..let’s put some candles on these babies: Happy 35th Janie! I haven’t watched chopped. Is it on Food network? I think there’s too much cocoa powder in the brownies! I made them, and they were so dry, powdery, and bitter. I’d go with half or even 1/3 cup to start, and add from there. Or, better volume-wise, triple or quadruple the dates, and use 1 and a half T vanilla. 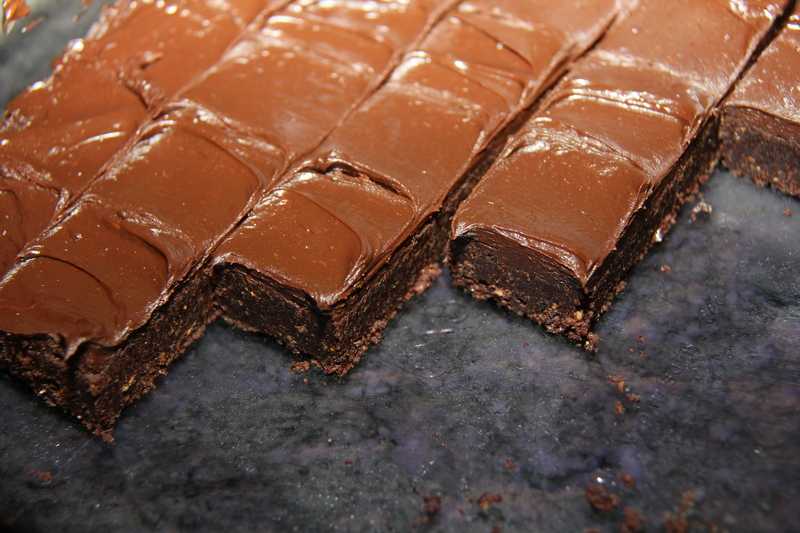 There are three main myths about the creation of the brownie. The first, that a chef accidentally added melted chocolate to biscuit dough. The second, a cook forgot to add flour to the batter. And thirdly, the most popular belief, that a housewife did not have baking powder and improvised with this new treat. It was said that she was baking for guests and decided to serve these flattened cakes to them. This became our beloved treat of today. Whatever may be the case; all three myths have gained popularity throughout the years due to its mysterious beginnings..
My mouth is actually watering looking at this. Going to Costco tomorrow, buying the dates and making this.